In about 70 kilometres from Athens towards the tip of the Attica peninsula one finds the cape Sounion. There you can admire the ruins of an ancient Greek temple of Poseidon, the god of the sea in Greek Mythology. To the ancient Greek, every natural feature was controlled by a god so everything was based on the notion that one must constantly seek the favour of the gods to avoid misfortune with gifts and sacrifices. In a country like Greece the god of the sea was very high in the divine hierarchy, only second after Zeus. 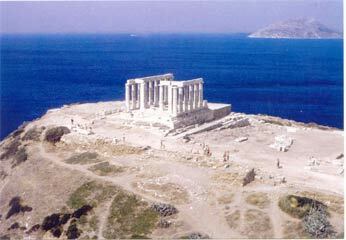 The temple at Cape Sounion was a venue where mariners, cities and states were making sacrifices to Poseidon. The temple was constructed in 444 BC, this was during the ascendancy of Athenian statesman Pericles, who also rebuilt the Parthenon in Athens, and it is perched above the sea at a height of 60m. , the design is a typical hexastyle and it has a great resemblance with the Temple of Hephaestus in Acropolis. The temple of Poseidon was destroyed in 399 by Emperor Arcadius. In 1906 archaeological excavations revealed numerous artefacts and inscriptions, a very impressive marble kouros statue and a votive relief , both of them are now in the National Archaeological Museum of Athens. The Romantic poet Lord Byron mentions Sounion in his poem Isles of Greece and his name is carved into the base of one of the columns of the Temple of Posseidon . Apart from an archaeological site, Sounion is an upscale summer home location for Athenians. Sounion is one of the most expensive areas in Greece, with the value of some homes exceeding twenty million euros. The site is a popular day-excursion for tourists from Athens, as they can watch the sunset over the Aegean Sea from the ruins, a moment hard to forget!